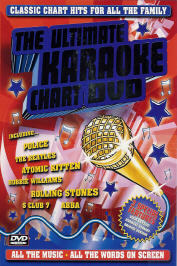 Gather the family around the TV for AVID's sensational new DVD - The Ultimate Karaoke Chart DVD. We have collected together a dozen of the greatest chart hits from the last 30 years from ABBA to Atomic kitten, and from Sinatra to S Club 7 to bring you the very best in family entertainment. The Ultimate Karaoke Chart DVD. It's the ONLY karaoke DVD you will need this Christmas.